James Cagney’s crime-busting thriller “G” Men (1935) and Buster Keaton’s debut short film One Week (1920) both contain exciting scenes filmed in Inglewood. Cagney portrays a new FBI recruit who helps the bureau capture notorious bank robber Danny Leggett, played by Edward Pawley. During a crime montage Leggett’s gang robs a bank, leading to a blasting machine gun police chase on the streets of Inglewood and beside the Inglewood train station. This aerial view of Inglewood shows two corners appearing during the “G” Men chase, the “orange” corner and the “yellow” corner (see below). LAPL. This aerial view above shows two parts of the chase, discussed further below. 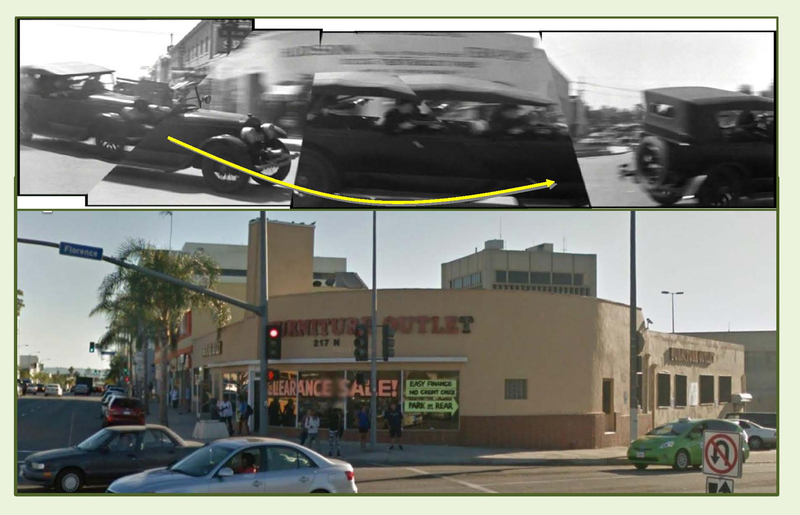 During the “yellow” turn the cars travel north up La Brea and make a sharp turn west onto Florence Avenue traveling past a building with a curved, 60 degree corner. During the “orange” turn they travel east down Regent Street before turning north up Market Street. Looking west down Regent from Market. Matching views above looking west down Regent during the “orange” turn. 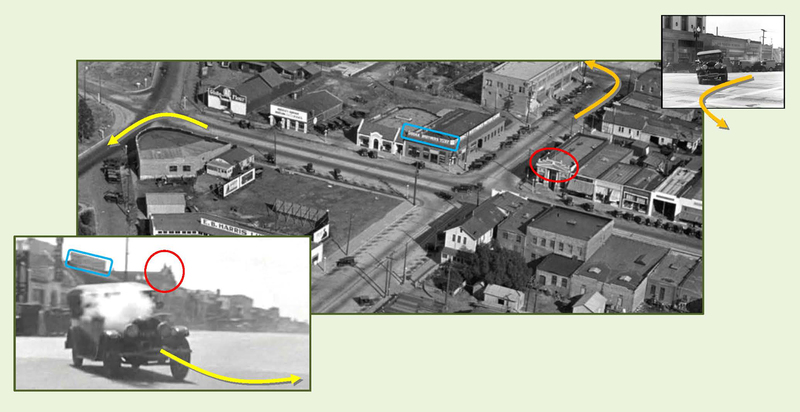 The corner building had its upper floor removed, but the building west of the alley (red box) remains unchanged. The start of the “yellow” turn – looking south down La Brea. LAPL. The “yellow” turn in “G” Men begins with this view above looking south down La Brea towards the corner of Regent, flanked by the corresponding blue and red symbols. The “yellow” turn continues by sweeping quickly past a 60 degree corner building (below) that remains standing. The 60 degree corner building standing at La Brea and Florence in Inglewood. 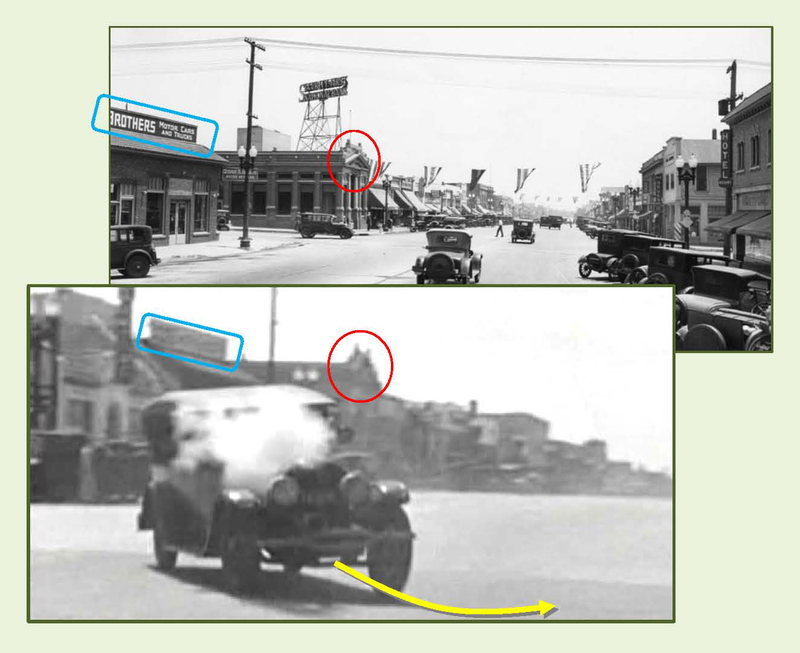 The “G” Men chase continues two blocks further west from the “yellow” turn, as the cars turn west from Fir Avenue, at Florence, and drive beside the train tracks that appear prominently during Keaton’s film One Week. Turning west from Fir towards the former Inglewood train depot. LAPL. As the cars travel west beside the tracks, the conspicuous rooftop sign for the C. GANAHL LUMBER CO., standing across from the depot, comes into view (red box). Looking west from “G” Men to the left, and east at Buster, to the right, crossing the tracks on Eucalyptus Avenue during One Week. 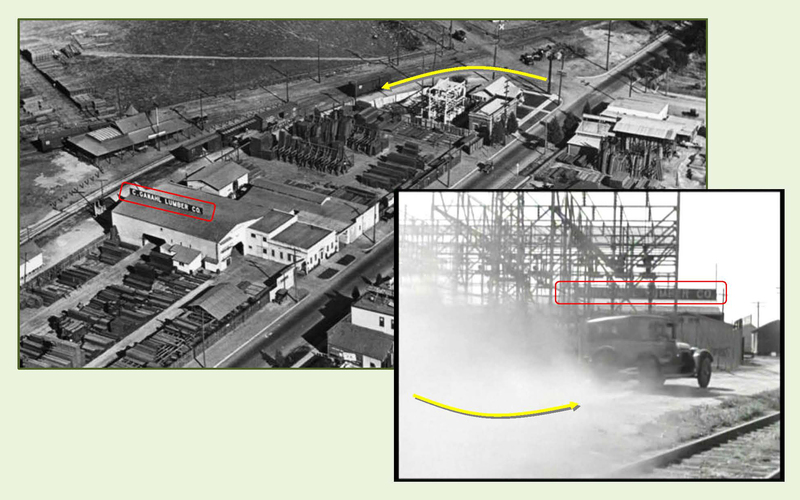 I discuss this setting from One Week in my book Silent Echoes, and in these posts discussing how the same location also appears during Keaton’s talking film Speak Easily (1932), and how Buster re-worked the train gag from One Week near the future site of Los Angeles International Airport (LAX) for his 1931 comedy Parlor, Bedroom, and Bath. Views west in “G” Men and east in One Week towards the former Inglewood train depot. The same lime storage shed (oval) appears in each image. My thanks to Christina Rice, Senior Librarian at the Los Angeles Public Library Photo Collection, for her assistance. “G” Men (C) 1935 Warner Bros. One Week licensed by Douris UK, Ltd. Color images (C) Google. This entry was posted in Buster Keaton, James Cagney, One Week and tagged "G" Men, Buster Keaton, Inglewood, James Cagney, One Week, Silent Movie Locations, then and now. Bookmark the permalink. That was a fun trip back in time! Really impressive research!! Thanks and keep it up!